My grandmother used to make this kolusa during our (my sisters, cousins and me) school summer holidays. Too young then to learn the recipe from her but enjoyed shaping the kolusa and eating it hot from the pan, because in those days fancy cookie cutters were not common. I found this recipe in my great grandmother's recipe collection. In the original recipe rice flour was used. 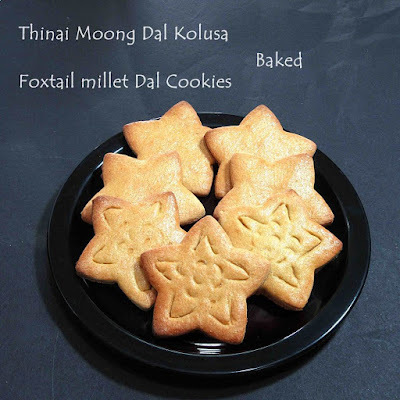 To make it more healthier I tried with thinai flour / foxtail millet flour instead of rice flour. Kolusa was usually deep fried in those days. I deep fried few and baked a few. I liked both the versions :). 1. Powder sugar and keep aside. 2. Dry roast moong dal in a kadai till it turns golden brown and a nice aroma comes. Do not burn it. Cool the dal and powder it. Sieve it and keep aside. 3. Mix the eggs with a fork just enough to blend it together, keep aside. 4. In a mixing bowl add thinai flour, powdered moong dal flour, powdered sugar and a pinch of salt, mix well. 5. Melt ghee and add to the above flour mixture. Mix well. 6. Add mixed egg mixture little by little and knead the dough. Add just enough egg so as to bring the flour together and form a dough. The dough must be thick. 7. Roll out the dough to 1/8 of an inch thickness and cut into desired shapes. 8. You can either deep fry or bake it. 1. Preheat the oven to 180 degrees for 10 minutes in mode 'toast'. 2. Brush the cookies on the top with the egg mixture. 3. Place the baking tray in the center rack of the oven. 4. Bake the cookies for 10 - 12 minutes at 180 degrees in mode 'bake'. 1. Heat oil in a kadai, fry the kolusa one by one under low heat. You don't have to refrigerate the dough before rolling out to make cookies. If you are deep frying it, then do it in low flame. Since it contains sugar, the outside browns quickly and the inside will be under-cooked.